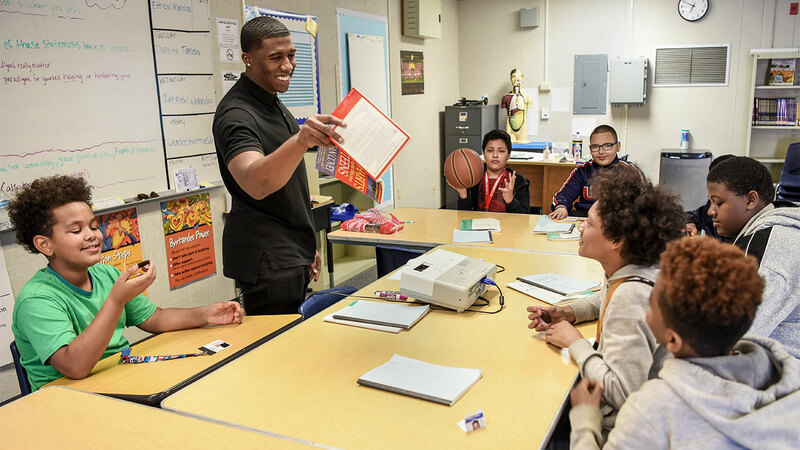 Myric McGhee, 24, has been a para professional at Wawona Middle School for two years working with special education students. He also oversees a mentoring class for 11 boys who have good attendance and motivation, but their grades and behavior do not reflect their abilities. Wawona principal Kim Villescaz said this about Myric: "Students go to him when they have a problem and he always goes above and beyond what is expected of him." Myric was a finalist in February for an Excellence in Education award. What does your job as a para professional in special education entail? My job as a para is to help support and encourage all of the students and make sure that everyone is up to speed on the lesson and getting the necessary help they need. If I had to choose I'd say the best part of my job is seeing the help you're providing actually making a difference in their lives and in the classroom. The most challenging part of my job would have to be breaking students' already established habits that aren't necessarily suitable in the classroom, and helping them form new habits that are accepted at school. My future goals are to finish med school and become an orthopedic surgeon. I also plan on moving to Southern California, opening my own practice and starting a family in Santa Monica near the beach. What do you draw on from your experiences as a student to help your students now? I draw on a lot of the tough times I had as a student in the class room. I struggled with the work and staying focused, but along the way I picked up skills that helped me change my attitude, my perception and reputation. Most people don't know that I love soccer and it has always been my passion, since a child. After breaking my leg in college my dreams were cut short. After great treatment and healing I one day hope to pursue my dream once again. My dream vacation is to one day travel to Spain with a friend and spend a week sight-seeing, exploring, learning new cultures and watching a Barcelona game.